If you've played any GTA V, you've probably heard at least some of these lines. Take a look at the people who say them, and what you might have missed. 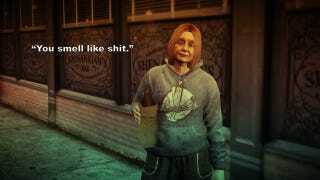 Redditor speedyturtle is going around and collecting all the idle chatter of GTA V's residents, setting them on some lovely Instagram-style photos of the NPC's who say them, in a sort of Humans Of Los Santos. It's got a slightly different feel from the original.